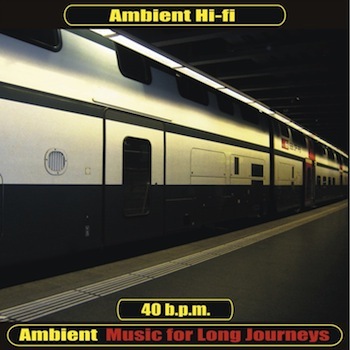 Ambient Music for Long Journeys Ambient Hi-Fi 40 b.p.s. – a hypnotic cinematic structured deep ambient sound design.Field recordings from train stations blends into a slow 40 b.p.m., constantly repeating and thrusting hookline bass and synth theme. Airy electronica beats and signature Being Ambient Music synthesizer pads evoke the dreamy, slick, outside-of-time quality of the modern long distance railway experience. 1. Ambient Hif-Fi 40 b.p.m.